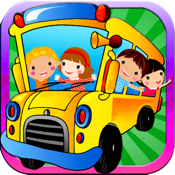 Experience the century old rhyme, Wheels on the bus, in an inspiring new way. Indulge on the myriad of breathtaking colors, pleasing animations, creatively narrated and melodiously sung rhymes & crisp images forged into this kiddish app. *WORDS! : A educative word game with varying difficulty.